“These medicines will make your weak hair fall off so you can have nice, long hair upto your waist.”, When my daughter saw most of her hair fallen on the hospital bed, this is the only thing that relieved her. She’s always loved long hair. 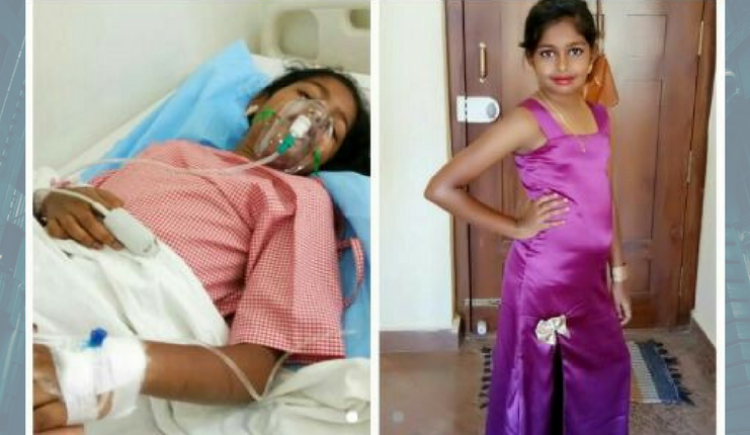 On seeing my pictures in photo albums she always exclaims, “I also want to grow really fast so I can have long hair like you, mumma.” My 9-year-old daughter Harini is suffering from blood cancer and she doesn’t know. She thinks she’s been taking hospital rounds because she has fever. 22 aggressive chemotherapy sessions later, cancer has still not left my daughter’s body. She needs to undergo 8 more to run past it. I have only Rs. 10 in my wallet right now and the cost to save my daughter’s life is at least Rs. 10,00,000. I’m in desperate need of funds, she’s my only child and everything I have. Please help me save her life. I’m Harini’s mother, Jennifer. I live in Bengaluru with my husband and my daughter. I’m a housewife and my husband worked as a taxi driver until a few months back. He used to make Rs. 8000 every month but recently due to his constant absence at work, he was fired. While I spent time with Harini, my husband ran around gathering money, paying bills and buying medicines. In the last 7 months, we’ve been drained off all the savings that we had and the loans that we had taken from our loved ones. Now we’re left with absolutely nothing and my child’s life depends on treatment that requires money. I just don't know what to do. How can I let my daughter die? In April 2017, after a few days of stubborn fever and cough, we rushed her to the hospital. I still remember how worried we were that day - it doesn’t even come close to the terror we brave these days. After a bone marrow test, we found out that our daughter has blood cancer. I blanked out. I knew I was going to be there for her throughout but what were we going to do about the high cost of the treatment? We’ve begged for money to everyone we know. That’s how we’ve managed to pay the bills so far. But cancer is greedy, it requires a lot more to let go off my daughter’s body - that’s why we need help from strangers who read our story. Whatever happens to my daughter in front of my eyes, happens to me. I feel the pain caused by every syringe and every pipe. The doctors have asked us to monitor her blood count every week. After surviving this painful ordeal for months, Harini now offers her hand herself and has become very comfortable with needles. I can’t decide if I should be proud or sad about her adaption to this life cancer has forced on her. Chemotherapy sessions have been very harsh on her. The medicines are given to her directly by inserting two pipes into her chest. Because of our financial condition, we’ve not been able to afford anaesthesia for my poor baby. I feel ashamed stating this; each shot of anaesthesia costs us Rs. 8,000 more. It breaks our heart to make our only child go through this hell of pain. With every session, she’s losing her hair and even vomiting most of what she eats. Her teeth have become brown and her stomach has developed a bulge. She doesn’t like seeing herself like this, she innocently asks me, “Why am I looking so bad?” and I do everything in my power to let her know that she still looks like a beautiful angel. Each session has to be supported with a bottle containing 5 ml of medicine that costs us Rs. 49,400. We need 8 such bottles to support the chemotherapy sessions she’s been advised to take. We’ve spent over Rs. 14 lakh already and I have no shame to admit that we’ve not got a single penny left. I have only one daughter and like any other mother, she means the world to me. I just want her to live. Please help me save my daughter’s life - I’ll be indebted for life. I have to take her for a blood test tomorrow and I have no money - what do I do? How do I still continue this battle against cancer? You can help Jennifer by donating to her fundraiser on Ketto. Feel free to ask Jennifer for a new update on this Fundraiser. 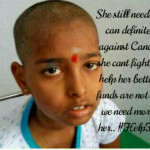 I Jennifer, Mother of Harini, Thanks all the donors and Ketto for their support in my daughter’s treatment of blood cancer. According to doctor, my daughter is 50% cured, and will have to continue the treatment for next two years. 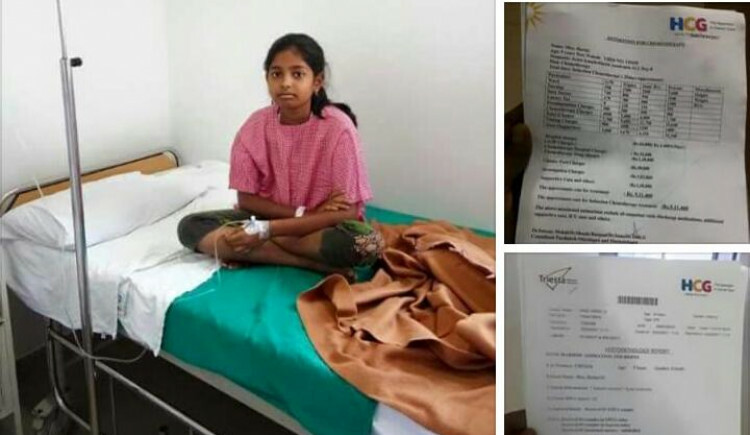 Harini health is stable and her body is also reacting positively thanks to God & you kind people. She has started going to school from June. 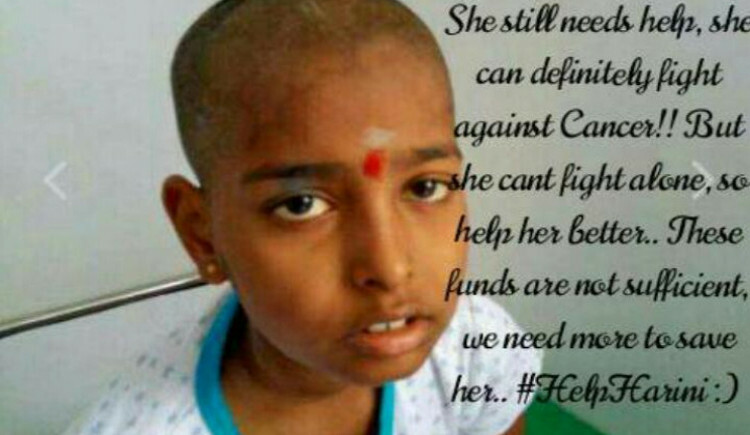 I humbly request if you people could provide additional support for future treatment of Harini. I hope that my daughter will get completely cured and get proper education. Your message will be directly emailed to Jennifer and you will receive his/her response on the email address entered below. 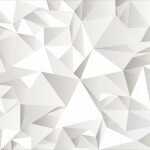 Your message will be directly emailed to Harini and you will receive his/her response on the email address entered below.